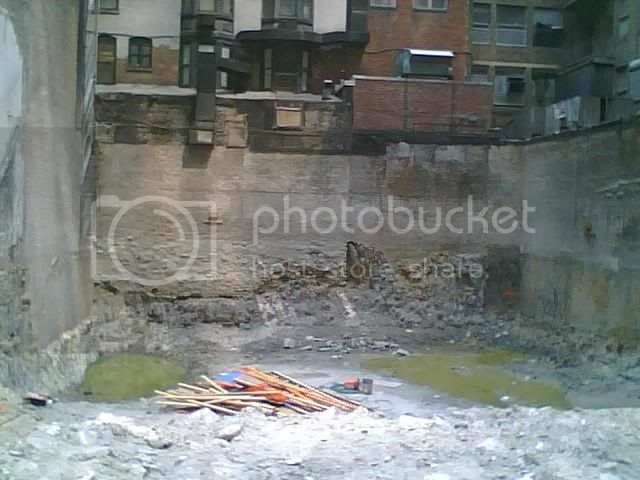 I walked by here on Sept. 12, 2006 and noted that preparation for demolishing the 3 buildings on this site has started. Yeah, I think this project should get its own thread. For anyone not familiar with this one, it was first reported and discussed in the Hotel news thread. The new "my community" feature on the department of buildings website is great. It shows all the new permits issued for whatever area of the city you are looking for. Cetra/Ruddy are the architects of record. 43 stories/495 feet, I would imagine this will be a 500 footer. The buildings are demolished already. Has actual Demo started yet on this site? I agree; this project (or any project by Norton or Foster IMO) is Thread - Worthy. Plans have been revised for a mixed-use tower that is planned to replace three low-rise buildings on 45th Street between Fifth Avenue and the Avenue of the Americas. 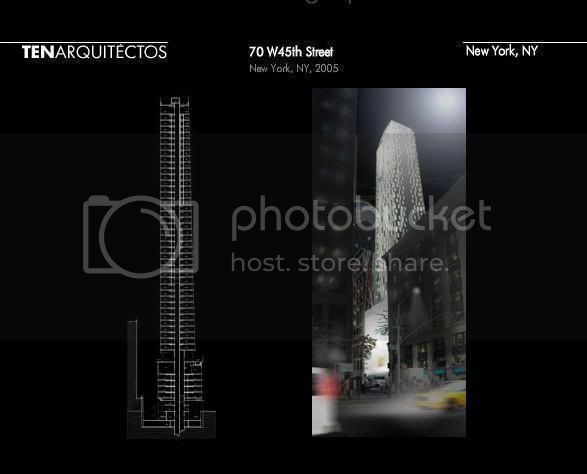 In June, plans for a 50-story building with 40 hotel rooms and 88 condominium apartments were unveiled by TEN Arquitectos, an architectural firm that has designed a new residential building under construction at One York Street in TriBeCa, and a new Library of the Visual and Performing Arts on Flatbush Avenue in Brooklyn. It had also designed an undulating mixed-use tower known as Harlem Park at Park Avenue and 125th Street but that plan has been dropped. According to plans filed with the city last month by John Cetra of Cetra/Ruddy, an architectural firm now working with TEN Arquitectos on the project, the new building will have 43 stories and 59 apartments. 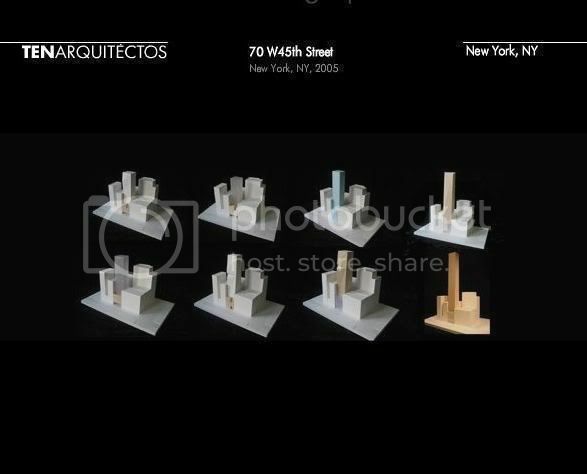 Irena Verona of TEN Arquitectos told CityRealty.com today that the revised project will still have some hotel units in addition to the 59 apartments. Waterscape Resorts LLC, of which Solly Assa is a member, is the developer. 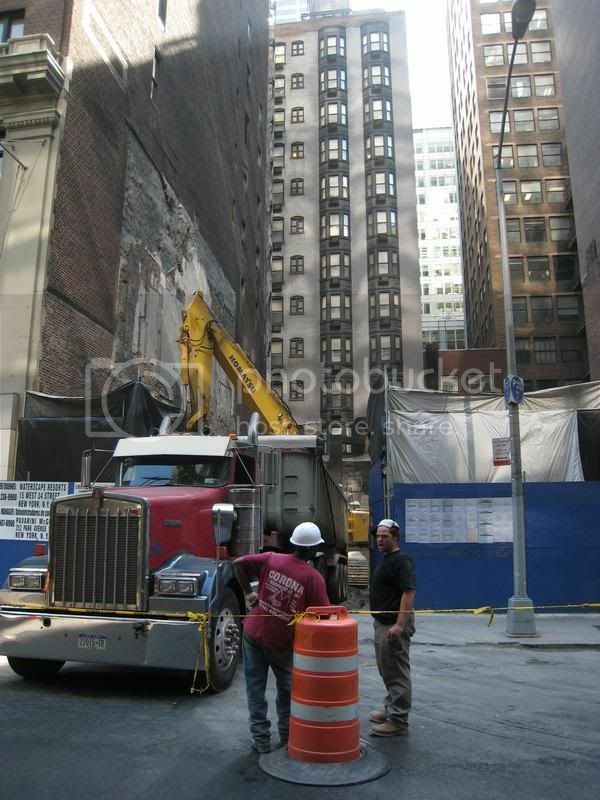 The site consisted of the 4-story building at 66 West 45th Street that housed the Vega House Chinese Restaurant, the 5-story building at 68 West 45th Street that housed Kitchen Provence, and the four-story building at 70 West 45th Street that housed Pizza Paradise. The site has now been cleared. TEN Arquitectos, which is headed by Enrique Norten, was founded in 1986 in Mexico City and opened an office here in 2001. It was the subject of a major exhibition at the Museum of the City of New York last year. 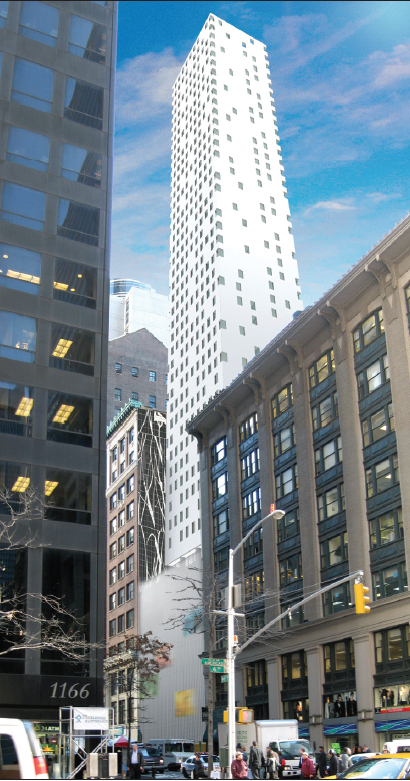 The 45th Street project is two doors to the west of the Sofitel Hotel and it is across the street from the black skyscraper at 1166 Avenue of the Americas, which has a large and lushly landscaped mid-block plaza. Not much new at this site in the past 6 months (DOB shows no new actions since DEMO sign-offs @ 11.2006). Looks like we're not missing much. Well now that it's a hole in the ground something must go up here....and this design looks nice to me. Nice streetwall height and facade, and more hotel rooms in a prime location. They are still digging the hole here -- chopping into solid rock. 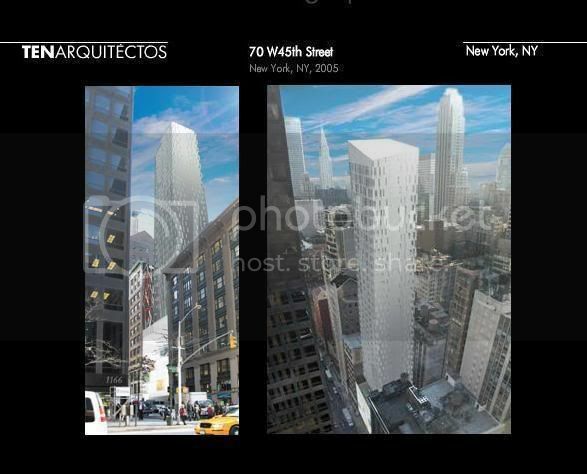 Yeah I see the difference between the two renderings. The previous one look more glassy and a little more interesting with those open windows patterns, but the new one not so much. I think this one might become a forgetable boring building in the end.